Have you heard of sheer brunj? Well, this is a variety of kheer but not just another kheer I would say. 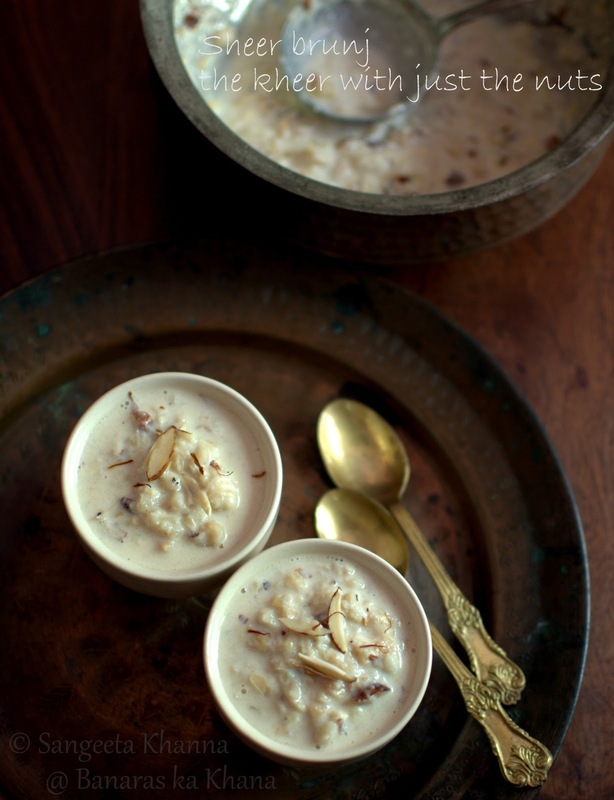 We all love kheer or milky rice puddings as I would introduce it to anyone who hasn't known Indian food. Which is quite unlikely in this age as I remember a Thai friend 23 years ago knew about kheer and pulav and he was introduced to pakode and much more at my place. You would agree people pick up Indian food pretty quickly and want to learn cooking once they taste it. No I am not talking about a complicated recipe of kheer that takes 2 hours to cook. 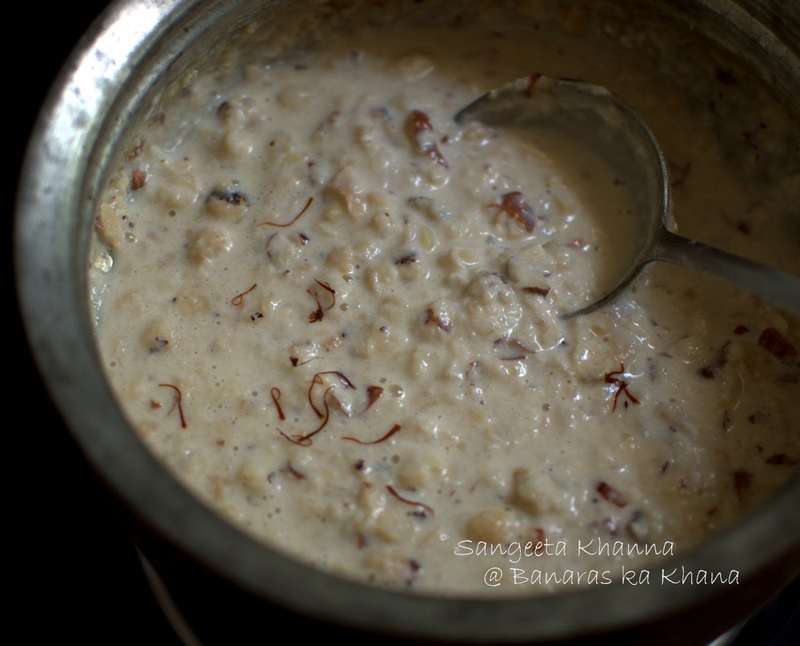 Having said that, all true kheers are slow cooked to get that taste. Otherwise it is just doodh wale chawal or mewe wala doodh for us. We wont call it kheer if it is any lesser. Sheer brunj is the queen of kheers I would say. Or so I have grown up believing. This used to be the one kheer to impress the impressionables and to brag about when it was cooked for family get togethers. And yes, most people used to pronounce it like biranj or biranji. I figured now that most people have forgotten this name, have stopped making such a kheer just because it feels heavy on the calories scale. But then brunj was always served in small quantities. I wont add up to the mystery of this recipe any more. This recipe takes about an hour to cook for 4-6 servings, but you don't have to work for more than 10 minutes that is for chopping the nuts and roasting the makhane. The milk keeps reducing all this while. Pour milk in a heavy bottom pan and heat till it boils. Simmer on low so the milk starts getting reduced. Place another thick bottomed pan on the other burner and tip in the makhane in it. Dry roast on low heat till they start getting pinkish in color and become crisp. 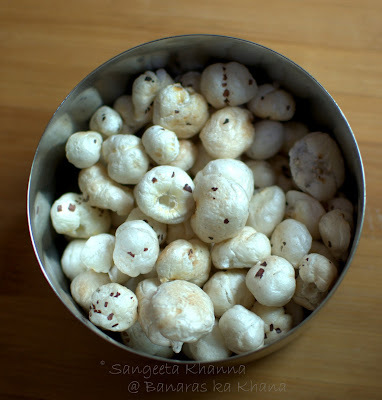 You can add 2 tbsp of ghee to the makhanas so they would turn really aromatic and would make the brunj rich. I avoid adding ghee at this step as I find it too much heaviness for a dessert. Let the makhanas cool once they are all crisp and pinkish. Place them into a deep bowl. This a large 600 ml katori I used. And crush them all using the bottom of a tumbler or any instrument you find useful for this. A pestle would work nicely too. The nuts will be crushed roughly, so you end up with a few bits and some powder. 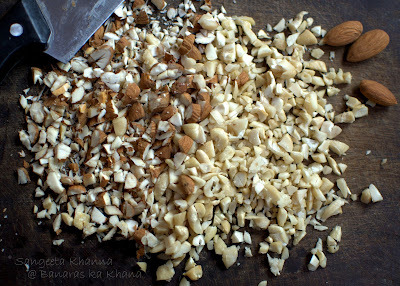 Chop the almonds and cashew nuts roughly. To make the chopping easy, just rinse them all with water once, wait for about 10 minutes (this was the time I was dry roasting the makhanas) and then chop them on a board. By this time, around 10-15 minutes or more if you have been doing a few other things on the sly, the milk has been reducing. 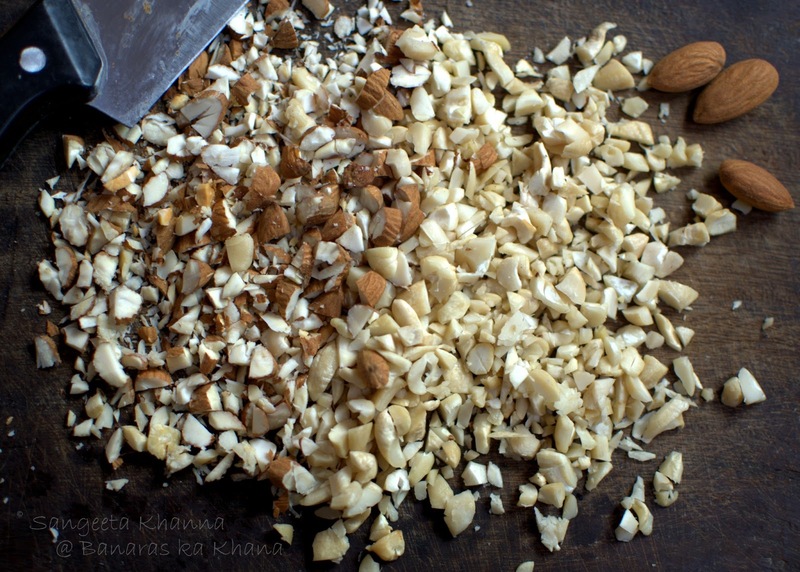 All these chopped and crushed nuts will be added once the milk is reduced to half. Simmer the brunj for another 10 minutes or till it gets thick and creamy. Add the sugar and malai or fresh cream to it, stir well and take it off the stove. Add the saffron, stir and keep covered for about 5 minutes. The pan is opened to welcome a wonderful aroma. Most people like raisins in this kheer but somehow I always skip adding them. I am not too fond of soaked plump rasins. You can always add some chironji, some melon seeds and some pistachios as well. The mix of nuts is a personal choice so go with what you like. But there will be no rice or other grains in this kheer for sure. 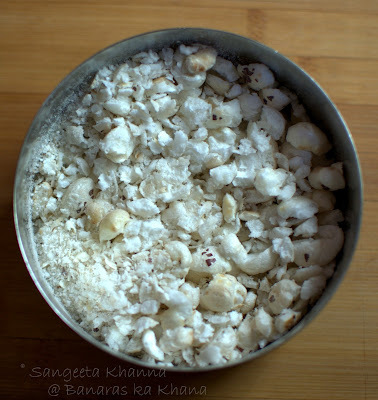 Some people add khoya (dehydrated milk) to thicken it, that is also a personal choice. I like the aroma and rich taste we get from reducing the milk slowly. I cooked it in a copper handi that is tin coated on the inside. It doesn't add to the flavors but a handi is a convenient vessel to cook milky dishes. This kheer called brunj or biranji is served hot or warm. Even at room temperature but I don;t remember having it chilled. Even now I don't like it chilled. Warm it should be for me. The nuts provide a nice mouthful of textures, makhana becomes soft almost giving it a feel of bread pudding when the brunj is served hot. Chill it and the makhanas will be slightly chewy, though the taste wont change. The texture of fried makhana in ghee is better if you like to do it that way. Do let me know if you make it, hot, warm or chilled?